Over 80 years since the first Servis machines appeared our new range of appliances demonstrate our continued commitment to innovation, design and peace of mind. 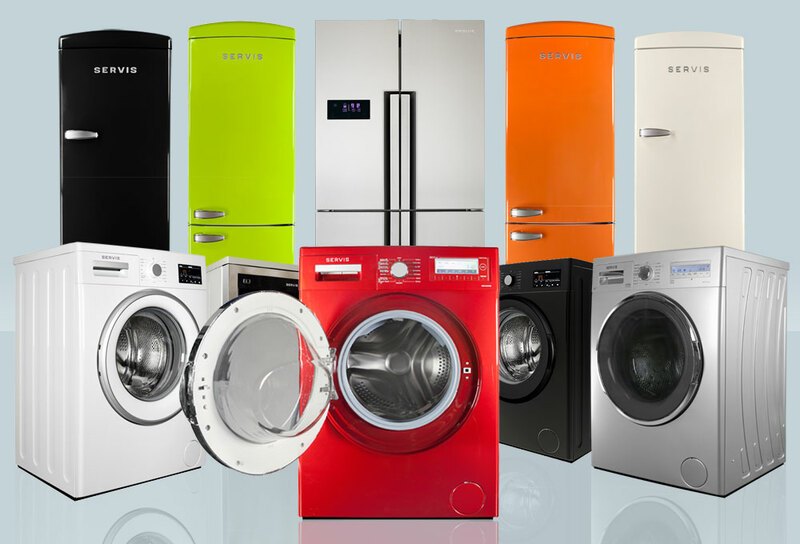 From our market leading technology to our fabulous looking Retro Fridge Freezers and Fridges all protected by our comprehensive warranties (up to 5 years in some cases). We’re convinced Walter Wilkins would approve. The 1980s were dominated by the Servis Quartz range. These innovative machines were the first washing machines in the world to harness quartz technology for increased precision. This made the Servis Quartz one of the most advanced and reliable washing machines of its time. In fact some Quartz machines are still going strong today, over 30 years later. The 1970s saw Servis continue to update and improve our range. 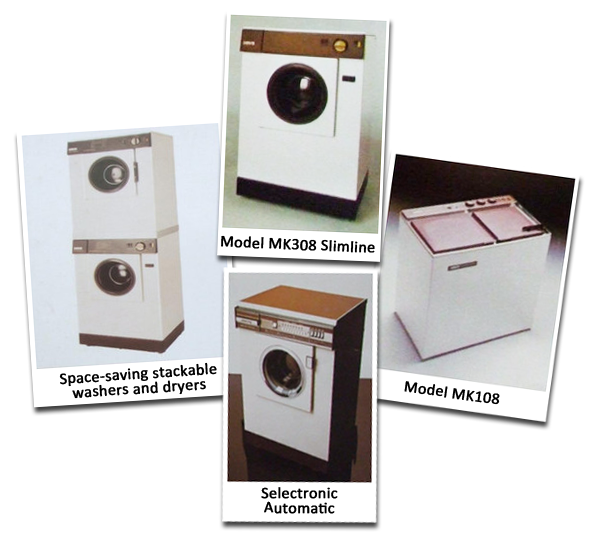 New front loading automatics came on to the market together with tumble dryers designed to stack on top of the washing machine and save space. 1973 saw the launch of the first Servis dishwasher expanding our range of time saving machines. 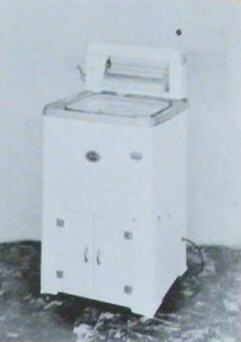 Then in 1976 Servis launched the Selectronic – the world’s first computer controlled washing machine. By the 1960s thousands of Servis machines were being made each week. A team of over 300 mechanics covered 3 million miles every year to ensure that Servis washers were ‘Serviced Wherever Sold’ continuing Walter Wilkins’ philosophy of great aftercare. 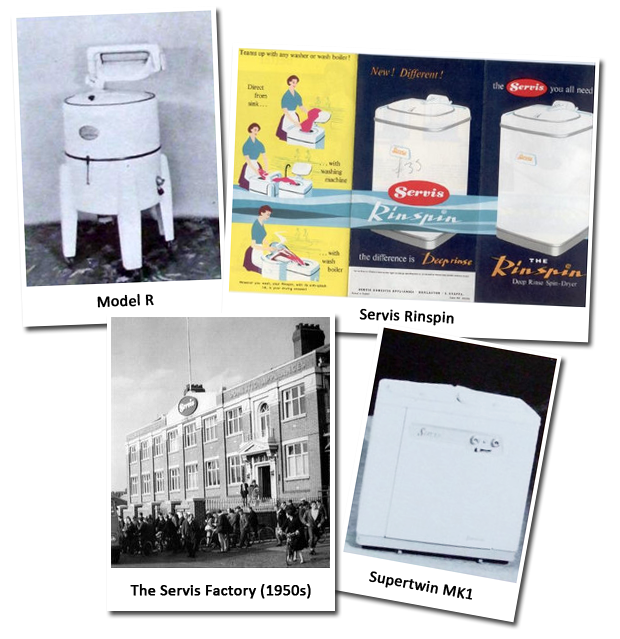 Servis continued to innovate throughout the 1960s introducing their first tumble dryer, the Supadry, in 1962 swiftly followed in 1963 by the Mark 22, Servis’s first fully automatic washing machine. A national steel shortage after the war didn’t make Servis’s return to the washing machine business easy with lack of materials forcing the 1950 Model R to return to an older ‘three-legged’ design. But whilst the outside was a nod to the past; inside was the first self-contained heating element. A major step forward in washing machine engineering. 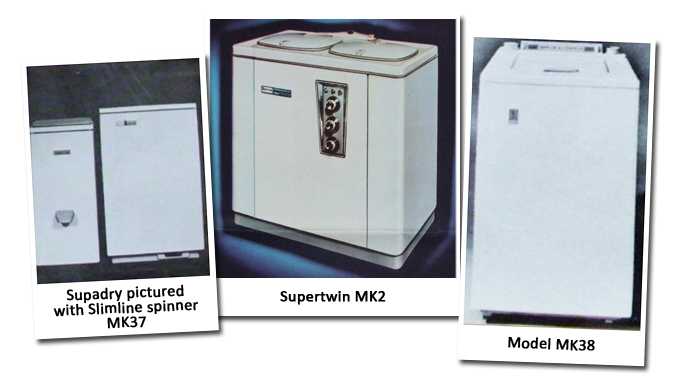 Progress continued apace with the introduction of Servis’s first spin dryer in 1959 quickly followed by the launch of our first twin tub, the Supertwin MK1, later the same year. During World War 2 washing machine production stopped as the factory was turned over to supporting the war effort. 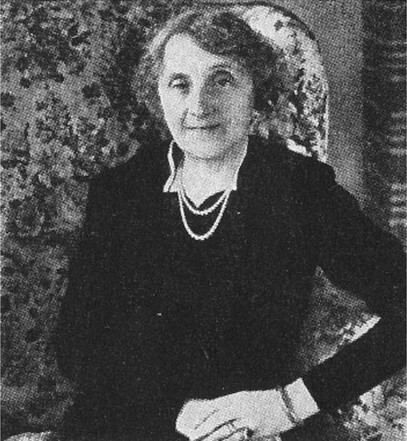 On Walter’s death in 1946 his widow Louisa took over the running of Servis. How fitting that the woman who had seen how popular washing machines would be should head up the company that Walter Wilkins had built up. 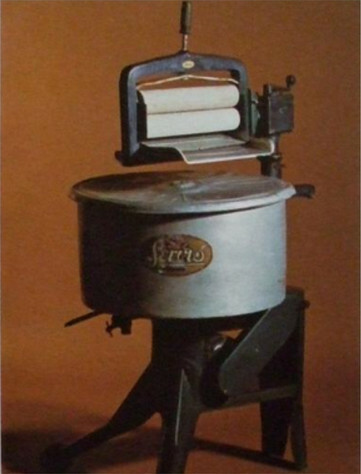 In 1935 Servis help make kitchens look better with the launch of their first machine in a cabinet the Model ‘E’. The Model ‘G’ launched in 1939 made washdays even easier as it was the first domestic washing machine to be fitted with a pump. This meant water could be pumped into the sink rather than having to be drained into a bucket. Servis launch their first washing machine. Walter Wilkins had seen washing machines on one of his trips to the USA and his wife had no doubt they would be popular back in the UK. Only 50 of the appropriately named Model ‘A’ were built but they were the first all electric all British washing machine made. Even at this early stage Walter was mindful of the fact that aftercare was important and made sure a couple of the factory workers acted as ‘troubleshooters’ in case customers encountered problems with their machine. Nearly Sunk Before Servis Started! The story of Servis nearly ended before it began. Wilkins and Mitchell were due to set sail for a fact finding tour of America on the ill-fated Titanic. Without the last minute business commitments that changed their travel plans, the history of washing machine development in the UK might have been very different. Good friends, Walter Wilkins and Tom Mitchell set up Wilkins & Mitchell Ltd in Darlaston, West Midlands. The engineering firm that would go on to set up Servis.